Hungry? I hope you bring company, or at least a healthy appetite, to Carelli’s Pizza & Pasta in Craig, a short drive west of Steamboat Springs on Highway 40 in northwest Colorado. The calzones are enormous, stretching in a couple of instances to two or three feet. A more reasonable monster is the Carelli Calzone, featuring a liquidy furnace of meatballs, sausage, ricotta and mozzarella. 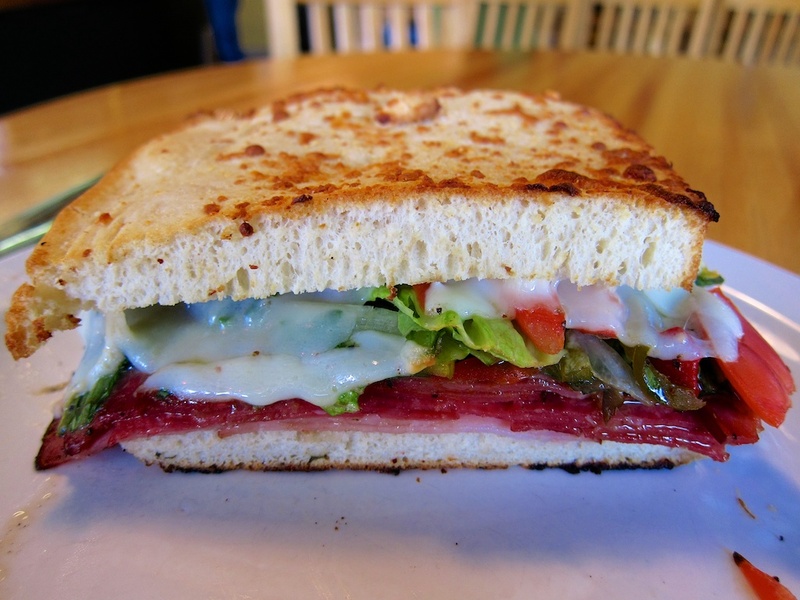 I settle for the merely massive Mancinelli sandwich—layers of mortadella, salami, capicola, ham and lettuce—heated in the oven till the provolone cheese melts and the focaccia is nicely toasted. Attacking with a knife and fork, I put a healthy dent in it but have to box the rest for a later road snack, er, meal. The two young women beside me have a more manageable strategy, ordering big, single slices of pizza. Farther west on Highway 40, Vernal, Utah is the nearest staging point for Dinosaur National Monument, established to protect an historic dinosaur quarry, which can be viewed by guided tour. 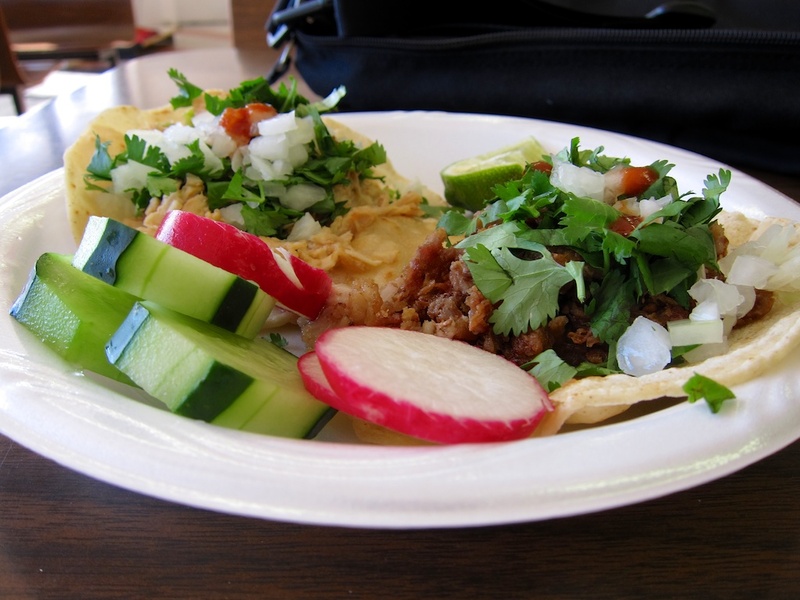 If you’d like a quick, authentic Mexican meal in town, stop at Tacos El Gordo (“Never trust a skinny cook”). Behind some non-operating gas pumps, El Gordo retains a faded convenience-store feel, with fridges full of sodas and packaged snacks for sale. Soon after placing my order at a little window, two tacos (pollo/chicken and carnita/pork) arrive—hot, crispy, a little greasy and flavourful, with a little bottled hot sauce added from the drink fridge. It’s a good, light lunch in an unpolished eatery for $4, a few bucks more if I’d gone for a burrito or quesadilla. I guess you could say I hit a double bagel in Park City. The place I want to go to, Nature’s Wraps, is closed, so I head next door to Wasatch Bagel & Grill (1300 Snow Creek Drive), where I have a chicken parmigiano sandwich on a fresh, toasted bagel. It’s decent, but the service is distracted, despite the place being mostly empty. The next morning, I drive a fairly long way to reach a different part of Park City, where I have a pretty good egg bagel sandwich (something I rarely order) at Park City Bread & Bagel (3126 Kilby Road), though the pounding soundtrack is annoying at 7:30. I then navigate through construction in a new mall nearby to have a nice coffee at Park City Roaster (1680 Ute Boulevard), though by this point I just want out of town. I know Park City is a big ski resort town (it has a much bigger tourist than resident population), is the principal location for the Sundance Film Festival and hosted some 2002 Winter Olympic events. But I don’t know if Park City has a historic centre. It doesn’t seem to have any centre, just a bunch of new, disparate developments with little character. It certainly helps to have a GPS to find my way around. Once you’re safely past the hour-long stress of driving the chock-a-block I-15 past Salt Lake City (it helps to tackle it on a Sunday morning), it’s worth slowing down and getting onto a quieter parallel highway. One such road, Highway 89 to the near east, leads into Brigham City, featuring a large, white Mormon temple, stately and well-tended historic buildings and a wide Main Street flanked by enormous overarching sycamores, their leaves still green in late October. When you see a sign saying, “Gone fishing,” you just figure you’ll come back another time. 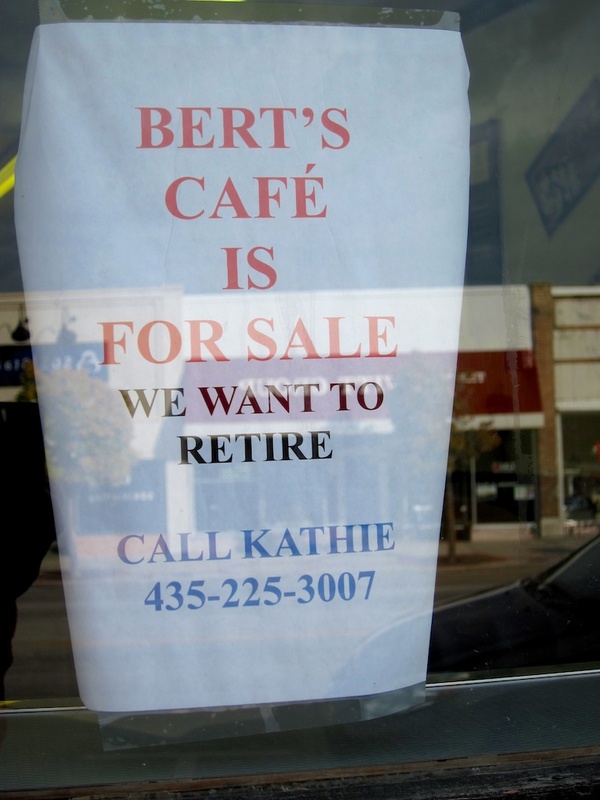 But Kathie and Bert, owners of Bert’s Cafe in downtown Brigham City want to go fishing full time… in Oregon. After 30-plus years of running a diner Bert’s parents started in 1929, they’re ready to retire and have put the place up for sale. Their own kids don’t want to run it, and Kathie doesn’t blame them, saying it’s a 24/7 business. Here’s hoping the new owners can somehow carry on the tradition, because this is a real old-fashioned diner, where the cutlery comes in a little paper bag, the waitresses chat leisurely with the customers and the food comes out hot and fast. My omelette special has nice chunks of avocado, the home fries are crispy and the butter melts into the steaming pancake. 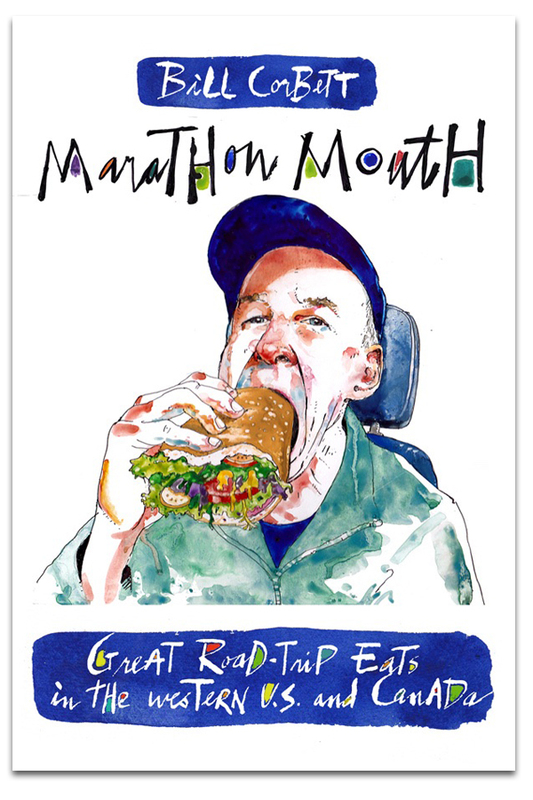 Lunch items include a sirloin sandwich and an open-face pot roast sandwich with gravy. It’s good, old-fashioned comfort food. Hey, if anybody knows what’s happened to Bert’s since I passed through last fall, let me know. The bad news: the owners want to sell. It’s hardly a news flash to say interstate highways have helped shut down many restaurants in the small towns they’ve bypassed. 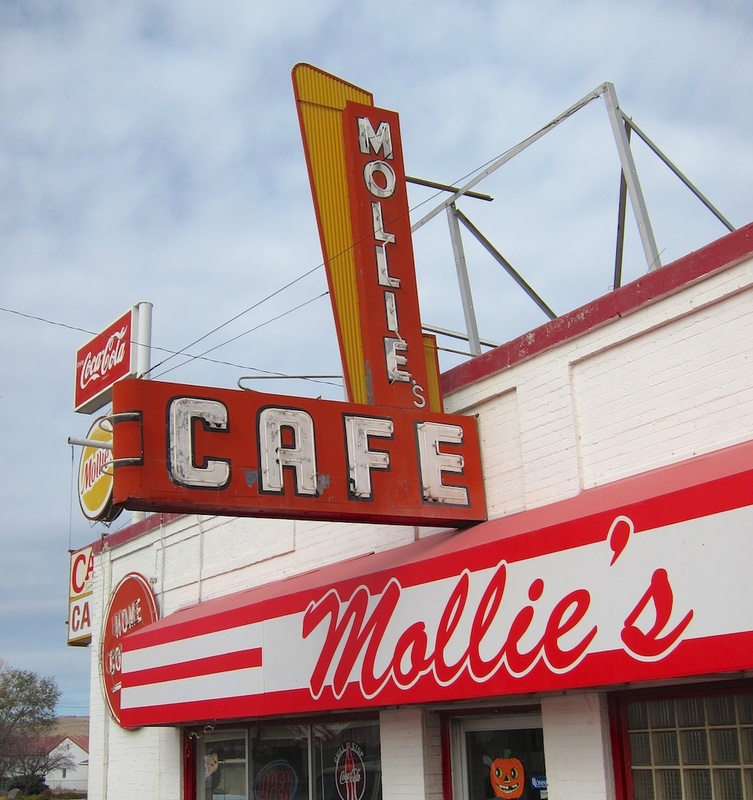 But some manage to persist, such as Mollie’s Cafe in tiny Snowville, just off I-84 near the Utah-Idaho border. Located in a century-old building and owned by Mollie for more than 30 years, it’s the kind of run-down-looking place many travellers might hesitate to enter. But once you walk past walls of old ranching photos, sink into a red-cushioned booth and watch heaping plates of eggs and cheese burgers go past, you know you’re in good hands. Indeed, the cook looks over the counter and asks me if I want the onions atop my little bowl of chili grilled (all of $2.15, including tax). After I’ve licked my bowl clean, she wishes me safe travels. It’s not the kind of treatment you normally get in places on the beaten path. This entry was posted in American restaurants, Colorado, Craig, Restaurants, Road trip food, Snowville, Utah, Vernal and tagged Brigham City, Craig, Park City, Snowville, Utah on June 7, 2013 by bcorbett907. I liked the variety of this chapter…saying what you DIDN’T like, which you don’t normally do. And helping those folks find a buyer…awesome! Probably had a cranky day in Park City. It’s generally not the intent of my blog to do bad reviews, but occasionally a rant slips out. I could probably do one for every resort town I visit (“Get me the hell out of here!”) What I liked about that blog is it included a few more old style, small town diners. Don’t know what happened to Bert’s. Regarding Carellis in Craig. First off, Craig and Cernal are on Highway 40, not Highway 24. Second, their strobilus will stretch to two or three feet, I have yet to see a calzone that big. You can trust this info as I personally know the owner and am a regular. Just thought you would want to correct you post. Meant Vernal, not Cernal. And am talking about Stromboli, not strobilus, whatever that is. Damn autocorrect.